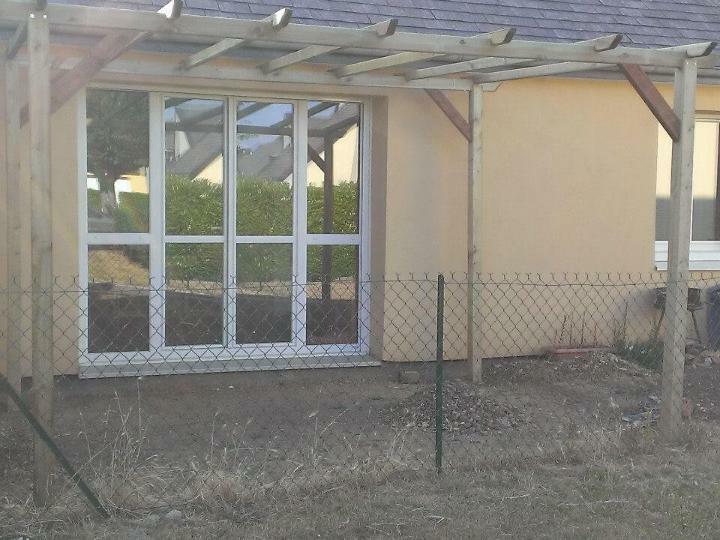 Outdoor improvements can really charge us bigger like that of making outdoor shelters, pergolas, garden gazebos! 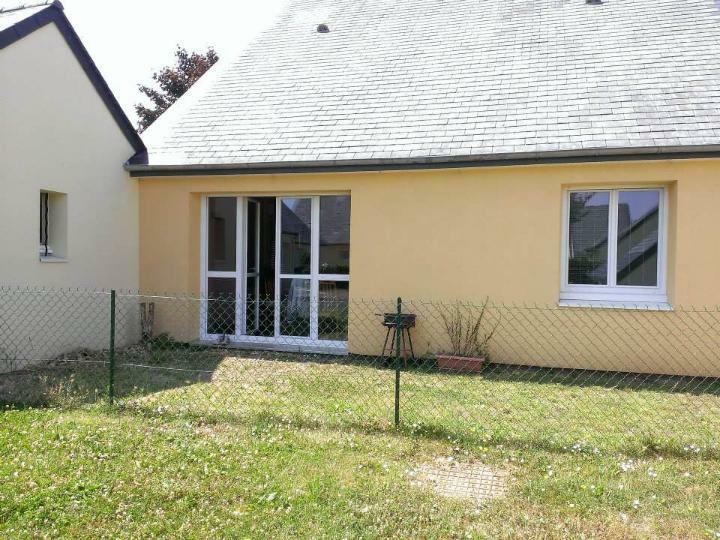 Garden and exterior home fencing, deck flooring and poolside renovations also cause great load on our wallet! 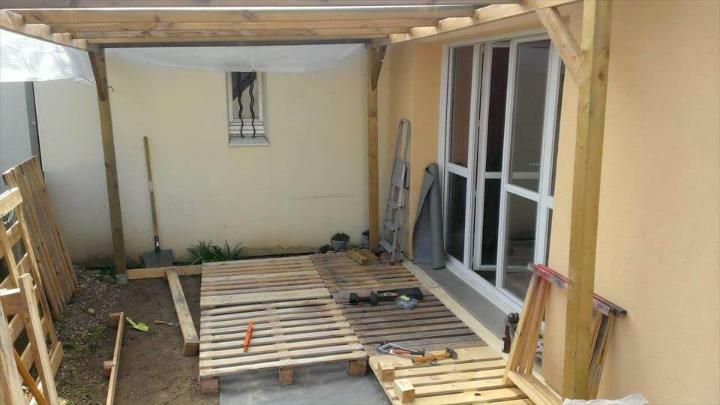 Going handmade with pallets can make you get with all these home outdoor improvements and fun setups at no-cost budget plan and don’t worry about the the appearance and design you will get all in modern and fashionable way! 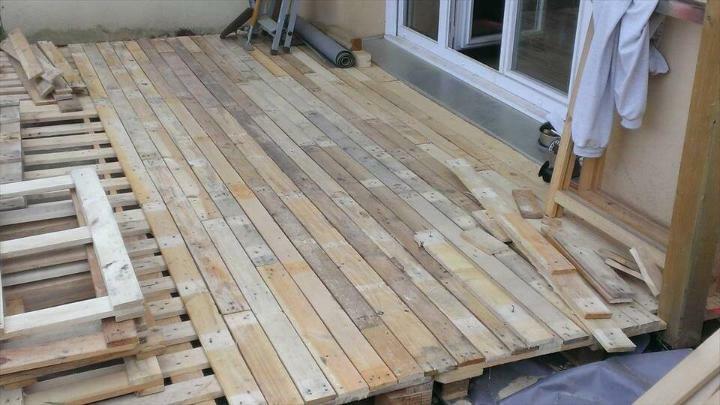 You can checkout this wood pallet deck project under gazebo that is sure to make any of your outdoor stand out and pleasing to eyes! 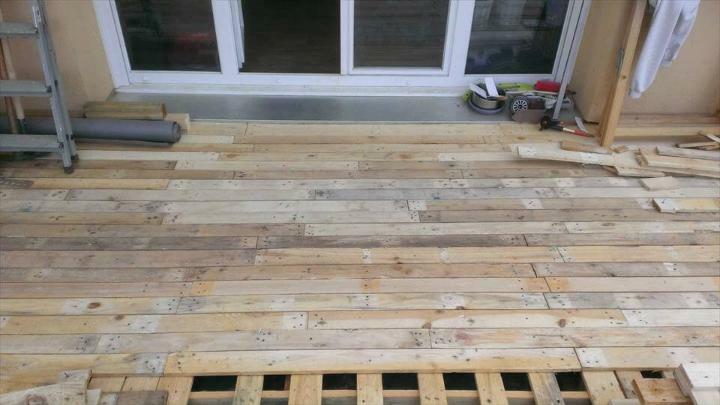 Pallet skids have been installed as units to create the wooden floor on a specified deck area! Boards have been floored up according to measurements and have also been modified to get that perfect size for best fit! A pallet shelter has also been made to protect the seated persons from killing sunshine in dead of summers! 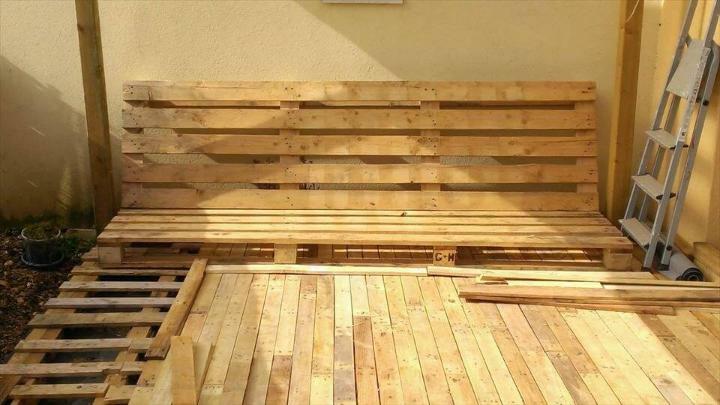 To accommodate sitting requirements a DIY pallet sofa has also been added and is super easy to build with whole pallet boards! Start collecting the shipping skids and get an improved outdoor on a budget you have never thought before! 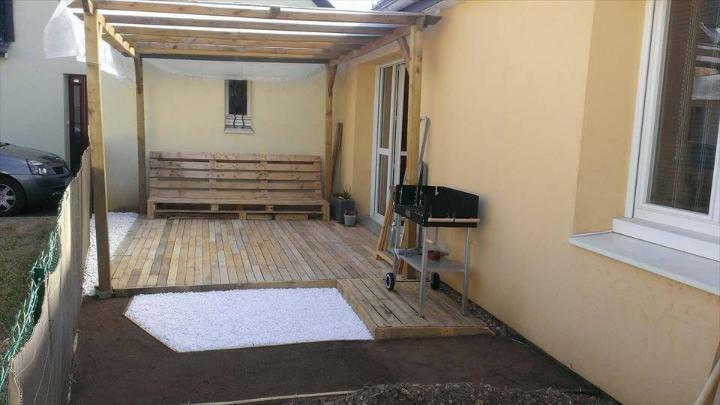 Target an outdoor area first where you want to install this amazing pallet wood shelter and flooring and make the area cleaned and bugs free! 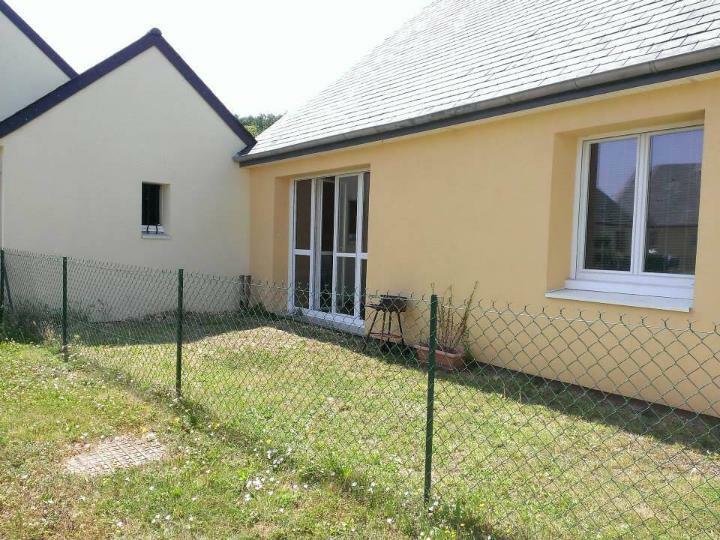 In this case an area just beside of garden fence has been selected! This is the front preview and you can also find some awesome and visually attractive places at home outdoor to install such a cozy sitting arrangements to relish the outdoor comfortably! 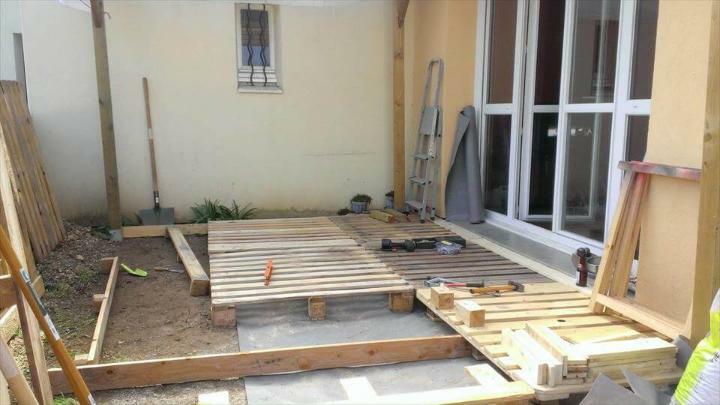 Push the top soil down using the proper tools and also water the soil to get all hard to avoid unbalanced and uneven edges of the wood pallet floor! Grass has been rooted up to let the wooden pallet boards tightly fixed in the ground! By adding or removing more soil you can also get a plane and balanced level of your targeted area which is just to be modernized with pallets! 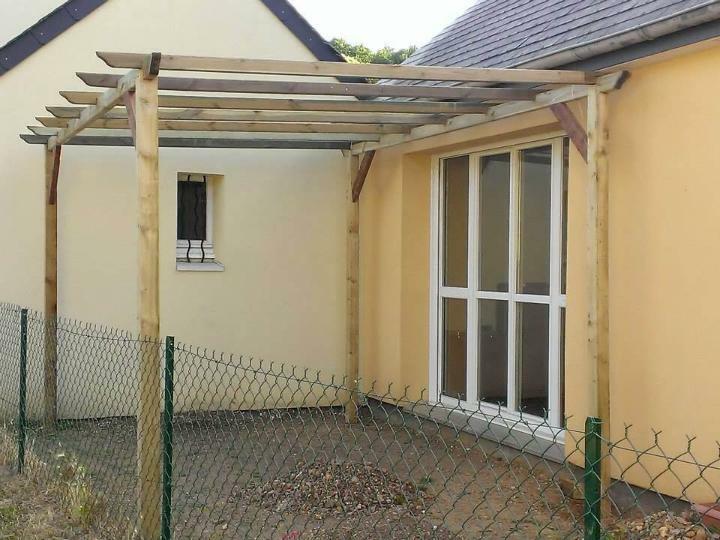 Start the project by installing a pallet gazebo or shelter first and you will require some extra large wooden beams and pillars for it! Here is a preview to help you! Start adding whole pallet boards for a rough flooring statement and keep on leveling to get the best results after completion! Use the hardware to hold all tightly in one place and also sand the pallets for a shining wooden appearance and do wash them if there is a large gunk layer on pallet wood surfaces! Give sharp and clean corner fit for a visual boost! After adding the whole pallet boards, now add the removed pallet slats as 2nd layer for a complete and finally finished gorgeous look! Go random and use different cut down sizes of removed pallet slats to create amazing pattern and styles! This is a step which really want you to go with your own creativity and ingenuity! Keep on layering the glue inside if needed and do add the nails to hold the planks in place! It would be fun if you go for it with a a team of your friends! After completing a portion, check the level using leveling tools and then go ahead to install next! Finely gritted and rubbed wood will have extra luster and shine on the wood grains to hold the observer’s attention! 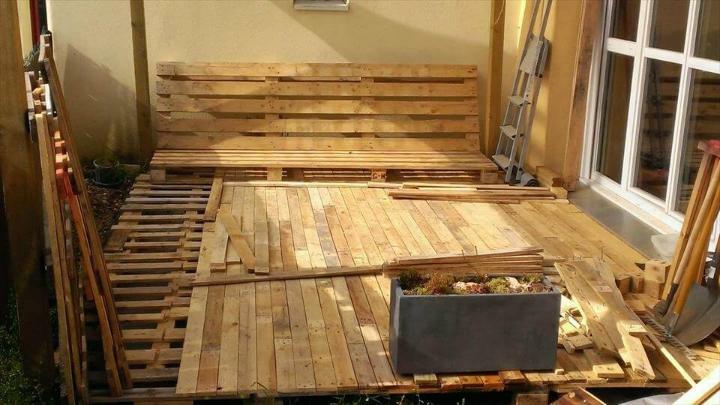 Also use the leftover pallet to build a sofa to accommodate the sitting demands for this renovated home deck area! It would be pretty easy to install, just build an “L” with a higher lover level and that’s it! You can see a sturdy pallet sofa in the preview which can really accommodate 3-4 people for comfortable sitting all the day long! Give complete sanding and then a varnish coat if possible for alluring shine on the wood grains! Also use the stain to get the wood more stable to live longer! Stain would really protect the wood from being influenced by the bad outdoor weather and will keep the wood safe from early signs of aging! 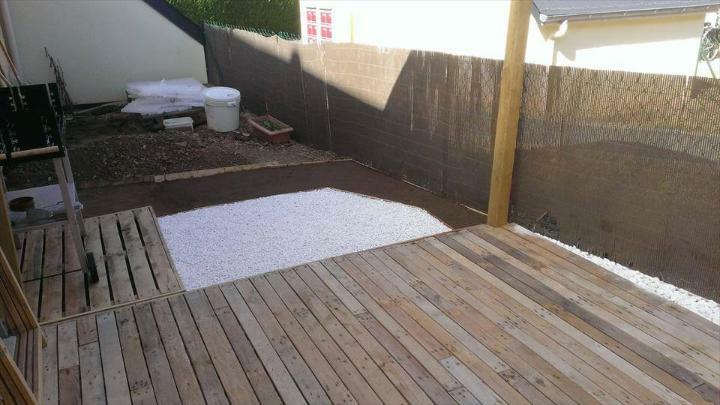 After the complete pallet decking the corner has been finished with a carpet or floor mat to take your shoes off while entering to this self-organized home deck area! 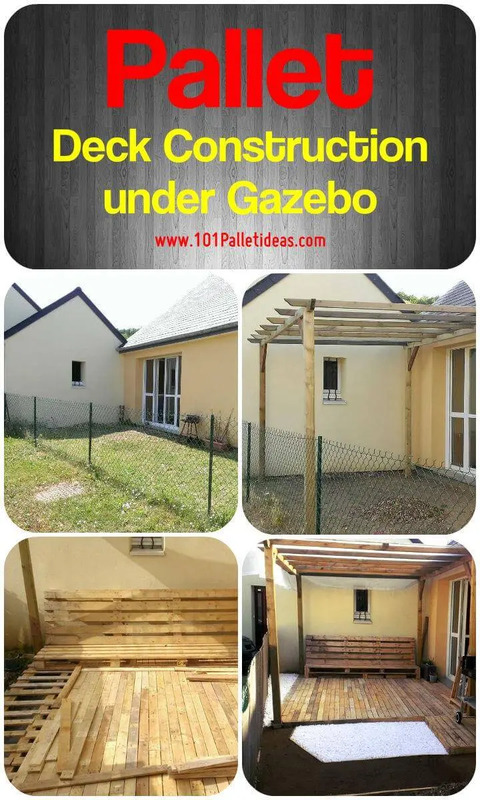 You can install a garden gazebo or a pergola setup easily by giving a little bit more creative width to these pallet projects and can enjoy a luxurious life eve on a budget! 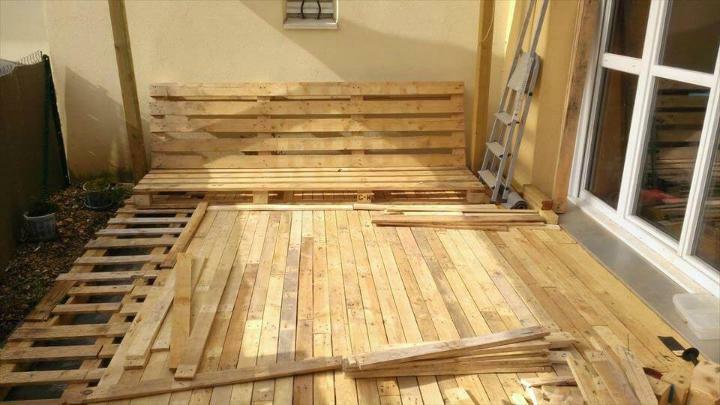 Also build the garden and patio set with pallets and get all focally stimulating that is linked to your home!